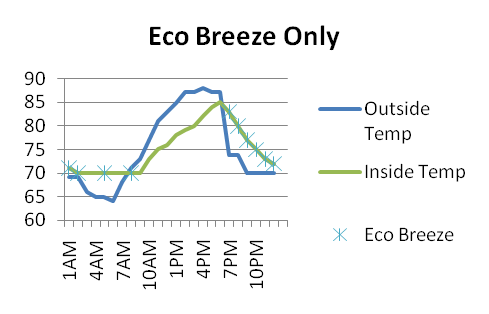 Eco Breeze turns your regular window into a smart, cooling window that knows when to bring fresh, cool outside air in. Eco Breeze will maximize fresh air cooling making you more comfortable. With daily temperature swings of 20 degrees fresh air cooling is available on all but the hottest days and it’s free! Eco Breeze automatically uses fresh air cooling eliminating the guesswork associated with the daily task of manually closing and opening windows. Eco Breeze will automatically cool whenever temperature and humidity outside are lower than inside. The set point prevents over cooling on cold nights. Eco Breeze fits easily in the bottom of a window and installation is a breeze. Eco Breeze is simple to use, secure, and eco-friendly. Operating Eco Breeze will maximize use of fresh outside air to cool your home. As soon as it is cooler outside than inside (and less humid) Eco Breeze will automatically open its louvers and turn on the fans, running until the room is cooled to your set point. Eco Breeze features will prevent your room from over-cooling and seal out hot air in the middle of the day.